This book is about much more than naked photos of your children showing up online. Will your kids’ social media accounts keep them out of that prestigious college? Will those naked photos on their cell phone that they didn’t request land them in jail or get them charged with a felony? Are your tweens and teens buying fake IDs on the dark web to get into dance clubs and buy alcohol? Will your child be charged with manslaughter for bullying? If the person they bullied commits suicide, the answer is YES! Are your kids buying drugs like Molly or tainted marijuana for parties on the Dark Web? Are things YOU post on social media about your children putting them in danger or affecting their future? Are Your Kids Naked Online breaks down the facts from fiction and is supported by academic research focused on technology, not only showing the real issues in an objective balanced way without down playing the real dangers and consequences, but also without fear mongering. The Goods end most of the chapters with a “What You Can Do” section that has tips and guidance for parents. Many of the chapters also contain a real life story of how the technology today is really impacting children and their families, and how it doesn’t matter if you are rich or poor, whether you live in a big city or a small town, what race or religion you are, the consequences that technology can have are indiscriminate. Chris Good’s and Lisa Good’s expertise as 20 year veterans in the Cyber Security and Information Technology Industry as well as parents of 4 (just four) teenagers gives them a unique and important perspective. As trained Cyber Security and IT Professionals, they understand first-hand the ins and outs of technology, as well as the underbelly of the dark web. As parents of four digital teens, they know what actually works, what your super smart tech-savvy kids can easily bypass and can relate to the reality of being a parent in the always-on digital world. The Goods have spoken at Harvard, NASDAQ, and Coca-Cola, as well as appeared on CBS and NBC TV shows about the importance of protecting your children online. Sharenting – Are YOU Endangering Your Children? Who’s Afraid of the Big Bad Cyber Bully? Most children today know more than their parents do when it comes to technology, which convinces many parents to take the parental path of least resistance. They throw their hands up in the air and state as fact, “What’s the use, they know more about technology than I do. They already have access, so it’s too late. I can’t do anything about what they do online. Hopefully, it will be okay.” This is not true. It’s not hopeless. There are options, and you need a plan. Knowing what the options are, what would work best for your family, and developing a strategy is perhaps one of the most challenging aspects of parenting in today’s digital world. 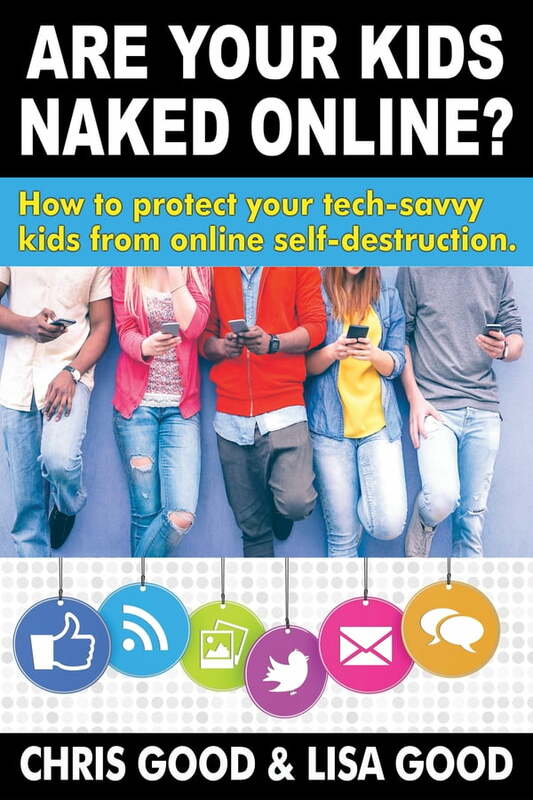 Are Your Kids Naked Online provides guidance from technology experts on how to build a plan to protect your kids from online self-destruction.